The USA Discounters website advertises its financing for military servicemembers and government employees. A discount retailer that sells itself as being friendly to military borrowers has been pushed into the spotlight, thanks to a report highlighting questionable lending and marketing tactics that lead some borrowers into lawsuits where they can’t reasonably defend themselves. A story published jointly by ProPublica and the Washington Post looks at the practices of a company called USA Discounters, a company that markets its financing plans to servicemembers and has locations near 11 of the nation’s largest military bases. 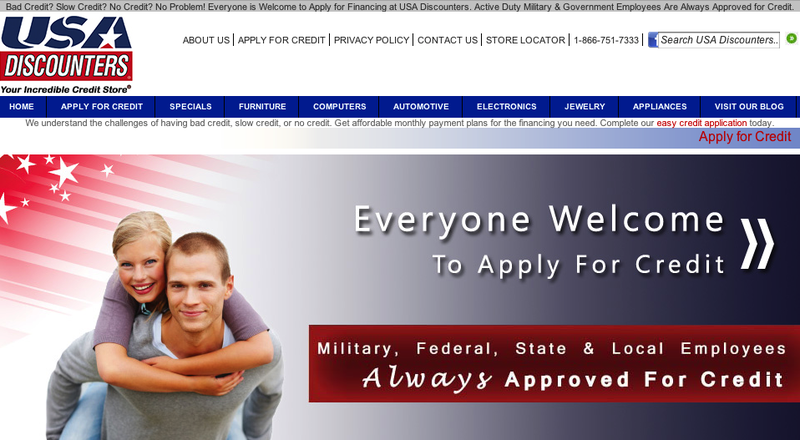 The retailer advertises its always-approved credit offers to members of the military with bad credit or no credit history. And yet, the prices on things at the store are not very good. For example, the US Discounters website currently lists a Samsung UN60FH6003F 60″ TV as a “special” that “starts” at twice-monthly payments of $47 for 24 months. So $94/month for two years equals $2,256. Meanwhile, you can get that same TV on Amazon for $960. ProPublica found an iPad Mini, which Apple sells for $329, going for more than double that amount, $699, at the retailer. What he really means is that the store is apparently taking advantage of the fact that some people with little to no credit aren’t experienced or knowledgeable about interest rates. $94/month for two years might seem like a good deal for the TV, but if you put the purchase on a high-interest credit card (20% APR) and made those same monthly payments, you’d be done with payments in only 12 months. The USA Discounters deal is like making the Amazon purchase with a credit card that charges around 98% interest. And this is without add-on fees that USA Discounters employees tell ProPublica they are encouraged to include in contracts. For example, there is the Army Private who thought he would finance a Toshiba laptop through the retailer. The laptop he bought could have been purchased elsewhere for around $650, reports ProPublica. But according to his contract, the price charged by USA Discounters was $1,799. Then there was a $191.56 warranty fee… and $17.57 in “credit life insurance”… and $248.22 in “credit property insurance.” Throw in taxes and another $16 for filing and “specialist fees” — and let’s not forget the finance charge of $561.47 — the total comes out to $2993.22, to be paid out over the course of 23 payments of $130.14. Again, had he been able to pay for this with a 20% APR credit card and made those same payments, he’d have paid for the $650 laptop in six months. Better yet, if he’d just saved the $130/month for five months, he could have purchased it outright without any credit. But the private fell behind on the payments, and USA Discounters filed suit — in Virginia, more than 1,500 miles away from where the private now lives. Unable to make the trip to Virginia for the court date, the company won a judgement of $8,626 against him. And he’s not unique. ProPublica reports that USA Discounters has filed more than 13,470 lawsuits since 2006 and that the company almost always wins in court. Some accuse the company of taking advantage of a loophole in the Servicemembers Civil Relief Act (SCRA), which gives active duty servicemembers the right to defend themselves but does not specify where lawsuits must be filed. That could explain why, with so many servicemembers strewn about the globe, USA Discounters has a tendency to file its complaints in the same two courts in Virginia. “This looks like somebody who has really, really researched the best way to get around the entire intent of the SCRA,” one retired Air Force judge advocate and expert on the SCRA tells ProPublica. Additionally, while the SCRA says that there must be a court-appointed attorney to represent servicemembers who aren’t there to represent themselves, Virginia courts allow the creditor to suggest which attorney should be appointed. ProPublica looked at 11 different cases and found that USA Discounters requested the same lawyer in each case involving servicemembers. USA Discounters denies any business relationship with this attorney and says it’s just trying to save its customers money by filing in a state that doesn’t require it to use lawyers to file. The retailer say it’s passing on that savings to its customers (though anyone who read the earlier part of this story might wonder how much the retailer would charge if it had to pay lawyers). Much like college students are targets of predatory for-profit colleges that talk them into taking out huge student loans without regard to their ability to repay that money, some say that “military-friendly” stores like USA Discounters go after servicemembers because they can easily seize a defendant’s wages. According to ProPublica, USA Discounters seizes the pay of more active-duty military members than any company in the country. The only factual issue with which the store’s statement takes issue is the claim that it always sues customers in Virginia. “If the consumer wishes instead to have the matter heard outside of Virginia, USA Discounters honors that request,” reads the statement.